Club meetings are held here typically on the first Sunday of each month. 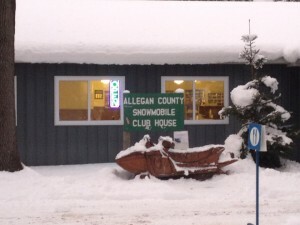 Besides club meetings, the snowmobile club hosts various events for its members. Some events held in the past are the pancake breakfast and the poker run. The clubhouse can also be rented out for special occasions. Please use the contact form to let us know what you are interested in and we’ll send you more information and confirm a reservation. The rental cost is $50 for members only. The person wishing to rent must be a current member and have been a member for one year prior to the rental date. Contact Nancy Jorgensen, 269 650-6282.